A joint initiative of the American Psychiatric Foundation and the Jed Foundation, a non-profit organization devoted to student suicide prevention, Transition Year addresses the unique challenges of transitioning from high school to college. The Transition Year website is designed to be a substantial resource, which involved developing a variety of custom applications. The site features both student and parent portals, offering access to articles, Q&A, customized tools, forums and more. Password-protected areas allow users to manage data on colleges, which can be pulled from the site's own college wiki. We also developed a Content Management System (CMS), which enables the client to update 90% of the site. 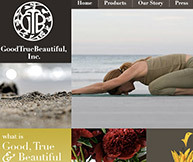 Being part e-commerce and part community, GoodTrueBeautiful, Inc. sought to engage and inspire visitors as well as sell products. We developed an e-commerce system with standard functionality for managing inventory, customers and orders. We also customized the system with advanced features for managing multiple account types - retail, wholesale and promotional - each with different pricing and shipping policies. The site is connected to FedEx servers to provide real-time shipping quotes and generate shipping labels as well as invoices. A reporting function enables the client to track and analyze sales data. 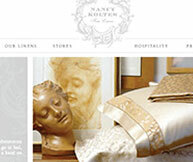 With her wholesale website, designer Nancy Koltes wanted buyers to experience the full breadth of her continually changing product lines. We created a custom CMS (Content Management System) that enables full control over the product database, including the ability to upload multiple images, market related products, and integrate photos into slideshows and pop-ups. In order to help drive traffic to Nancy Koltes' retail locations, we also designed a store locator, which allows users to search a retailer database, and see results in Google Maps. This website is no longer live. To view, click here and enter the password "viewnow." 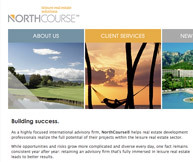 A real estate advisory firm, NorthCourse wanted to convey its international scope to potential clients, manage its client database, and use its website as a marketing tool in inventive ways. We created a custom CMS (Content Management System), including a sortable client list. The CMS interfaces with Flash Map, allowing the client to showcase the breadth of its client base as it expands to all parts of the globe. In a password-protected Reports section, the client is able to upload content for site visitors, and harvest email addresses in order to provide access. 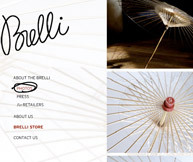 BRELLI, a subsidiary of PAM&Co., wanted a basic e-commerce website to market and sell its unique product, an environmentally friendly designer umbrella. The client has the ability to display various products and pricing for both wholesale and retail customers, process credit card payments, access reports based on sales data from the website, and export customer email addresses to an Excel spreadsheet. A venture-backed startup focused on women's sexual health, Semprae Laboratories anticipated a need to update content on an ongoing basis as it expanded and developed new products. In conjunction with the development of semprae.com, we created a custom CMS (Content Management System) that gives Semprae control over all text on the site, including formatting via HTML editors, as well as the ability to create HTML-based press releases and upload PDF files. Since employee recruitment was one of Semprae's primary objectives for the site, we also created a job application feature that enables users to apply for positions online. Uploaded resumes are stored on the server, and emailed to the client. 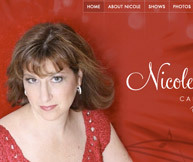 Singer Nicole Kafka wanted her website to help generate excitement and drive audiences to her performances. Since having an up-to-date schedule of upcoming shows was a primary objective, we gave Nicole the ability to not only update her photo slideshow on an ongoing basis, but also to categorize the photos. An audio/video section enables her to upload clips of past performances, which visitors can view in Quicktime. A mailing list signup form feeds into a database, which can be exported to an Excel spreadsheet. Text and other site content is updateable via a CMS (Content Management System). This website for a midtown Manhattan medical practice features the ability to update a variety of content, such as staff biography pages. The client is also able to create new dynamic pages in order to provide valuable, up-to-date patient care information and instructions. All pages and menus are generated dynamically through a CMS (Content Management System). Content can be formatted in MS Word and pasted into the site - the CMS converts the formatting to HTML. 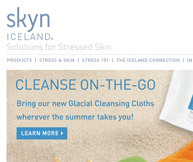 This skincare products retailer wanted custom features incorporated into its award-winning e-commerce website. We enhanced the site in a variety of ways, including adding functionality that allows the client to gift their employees a set amount of free merchandise each quarter. The client is also able to upload forms for retailers to download, as well as create accounts for retailers to access the forms. We enhanced the site's store locator, and created product backorder and out of stock features. Finally, we upgraded the site's administrative functionality to support multiple users with varying levels of security access.